For the Swiss sprinter, see Laurent Clerc (athlete). Teacher, co-founder of the first permanent school for the Deaf in North America. Louis Laurent Marie Clerc (French: [lɔʁɑ̃ klɛʁ] ; 26 December 1785 – 18 July 1869) was a French teacher called "The Apostle of the Deaf in America" and was regarded as the most renowned deaf person in American Deaf History. He was taught by Abbe Sicard and deaf educator Jean Massieu, at the Institution Nationale des Sourds-Muets in Paris. With Thomas Hopkins Gallaudet, he co-founded the first school for the deaf in North America, the Asylum for the Education and Instruction of the Deaf and Dumb, on April 15, 1817 in the old Bennet's City Hotel, Hartford, Connecticut. The school was subsequently renamed the American School for the Deaf and in 1821 moved to 139 Main Street, West Hartford. The school remains the oldest existing school for the deaf in North America. Deaf culture is the set of social beliefs, behaviors, art, literary traditions, history, values, and shared institutions of communities that are influenced by deafness and which use sign languages as the main means of communication. When used as a cultural label especially within the culture, the word deaf is often written with a capital D and referred to as "big D Deaf" in speech and sign. When used as a label for the audiological condition, it is written with a lower case d. Carl G. Croneberg coined the term of "Deaf Culture" and he was the first to discuss analogies between Deaf and hearing cultures in his appendices C/D of the 1965 Dictionary of American Sign Language. Jean Massieu was a pioneering deaf educator. One of six deaf siblings, he was denied schooling until age thirteen when he met Abbé Sicard, who enrolled him in the Bordeaux School for Deaf Children. There he learned to read and write French, and later helped develop the first formalized French Sign Language. He taught at the famous school for the deaf in Paris where Laurent Clerc was one of his students. He began work after a scandal in Paris in Rodez and dedicated his life to educating deaf children. Later he founded a deaf school in Lille, France. Born December 26, 1785 in La Balme-les-Grottes, Isère, a village on the northeastern edge of Lyon to Joseph-François Clerc and Marie-Élisabeth Candy in the small village of La Balme where his father was the mayor. Laurent Clerc's home was a typical bourgeois household. When he was one year old, Clerc fell from a chair into a fire, suffering a severe burn and obtained a permanent scar on the right side of his cheek. Clerc's family believed his deafness and inability to smell were caused by this accident, but Clerc later wrote that he was not certain and might be born deaf and without the ability to smell. The facial scar provided later the basis for his name sign, performed with the manual alphabet for "U", stroked twice downward on the right cheek. Clerc's name sign has become the best personal identifier in the American Deaf History. La Balme-les-Grottes is a commune in the Isère department in the Auvergne-Rhône-Alpes region of south-eastern France. Clerc attended the Institut National de Jeunes Sourds de Paris and was taught by Abbe Sicard and deaf Jean Massieu. Clerc eventually became a teacher there. In 1815 he traveled with Sicard and Massieu to England to give a lecture and coincidentally met Thomas Hopkins Gallaudet who was traveling in search of means for instructing deaf children. Gallaudet was invited to visit the school in Paris. 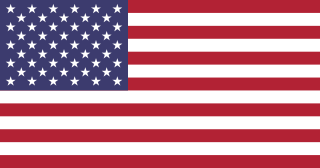 Then in 1816, after a few months of hospitation, he invited Clerc to accompany him to the United States to establish the first permanent school for the Deaf in Hartford, Connecticut, which now is known as American School for the Deaf. Institut National de Jeunes Sourds de Paris is the current name of the school for the Deaf founded by Charles-Michel de l'Épée, in stages, between 1750 and 1760 in Paris, France. He died at the age of 83 at his home in Hartford. The 1869 obituary in the New York Times says, Clerc came to Hartford in 1816 and became a teacher in 1817, then served more than 50 years "in the cause of deaf-mute instruction" and "his abilities, zeal, and graces of character made him always respected and loved." Clerc married one of the first pupils Eliza Crocker Boardman. Generally prior to the onset of organized education of the deaf, deaf people were regarded as uneducable and equalized them to idiots. Laurent Clerc became the most recognizable figure that shaped the education of the deaf in the United States as the exemplary personification of educability and high intellect of a person who could not hear since birth or during the early toddlerhood, nor speak and, despite these, acquired excellent command of spoken languages at the ages way beyond the prime age of natural language acquisition. 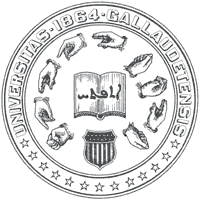 Gallaudet University is a federally chartered private university for the education of the deaf and hard of hearing. It is located in Washington, D.C. on a 99-acre (0.40 km2) campus. The Diary of Laurent Clerc’s Voyage from France to America in 1816 (West Hartford, CT: American School for the Deaf, 1952). 22 pages. An Address Written by Mr. Clerc and Read By His Request at a Public Examination of the Pupils in the Connecticut Asylum Before the Governour and Both Houses of the Legislature, 28 May 1818. Address at the Inauguration of Gallaudet University, 1864. Old French Sign Language is the language of the deaf community in 18th-century Paris at the time of the establishment of the first deaf schools. The earliest records of the language are in the work of the Abbé de l'Épée, who stumbled across two sisters communicating in signs and, through them, became aware of a signing community of 200 deaf Parisians. The history of deaf people and their culture make up deaf history. The Deaf culture is a culture that is centered on sign language and relationships among one another. Unlike other cultures the Deaf culture is not associated with any native land as it is a global culture. By some, deafness may be viewed as a disability, but the Deaf world sees itself as a language minority. Throughout the years many accomplishments have been achieved by deaf people. To name the most famous, Ludwig van Beethoven and Thomas Alva Edison were both deaf and contributed great works to culture. Ferdinand Berthier was a deaf educator, intellectual and political organiser in nineteenth-century France, and is one of the earliest champions of deaf identity and culture. The Second International Congress on Education of the Deaf was the first international conference of deaf educators held in Milan, Italy in 1880. It is commonly known as "the Milan Conference". After deliberations from September 6 to 11, 1880, the conference declared that oral education (oralism) was superior to manual education and passed a resolution banning the use of sign language in school. After its passage in 1880, schools in European countries and the United States switched to using speech therapy without sign language as a method of education for the deaf. A formal apology was made by the board at the 21st International Congress on Education of the Deaf in Vancouver, BC, Canada, in 2010 accepting the dangerous ramifications of such ban as an act of discrimination and violation of human and constitutional rights. Roch-Ambroise Auguste Bébian was one of the first hearing educators in France to achieve native-level fluency in French Sign Language. He wrote an important book titled "Mimographie," which was published in 1825, which utilized a method of writing signs. The Abbé Charles-Michel de l'Épée was a philanthropic educator of 18th-century France who has become known as the "Father of the Deaf". Sign Gene is a 2017 superhero film written, produced, and directed by Emilio Insolera. The story revolves around a deaf agent, Tom Clerc, from New York City who is a carrier of a powerful genetic mutation. He is sent to Japan with his colleague, Ken Wong, to investigate crimes believed to have been committed by Japanese deaf mutants. The film's characters, both villains and agent, use sign language as their superhuman powers. The film also stars Carola Insolera, Ben Bahan, Hiroshi Vava, Humberto Insolera, and Noboru Kuragawa. Tom Clerc is a fictional deaf superhero appearing in Sign Gene, the world’s first film about deaf superheroes. Tom is Italian American and comes from a long lineage of deaf families ranging back to the 1800 and is descendant from Laurent Clerc, French deaf teacher that established the first deaf school in the US along with Thomas Gallaudet. For the first time deaf people were able to get together and therefore gave birth to American Sign Language, thus, Laurent Clerc is also known as the “Father of American Sign Language”. ↑ "Pioneers in Special Education -- Laurent Clerc". 17 (1). Journal of Special Education. Spring 1983. ↑ "OBITUARY. ; Laurent Clerc, the Instructor of Deaf Mutes". New York Times. July 19, 1869. ↑ "Alice Cogswell Award - Gallaudet University". Gallaudet.edu. Archived from the original on 2015-11-10. Retrieved 2015-10-24. ↑ "A Settembre nelle sale "Sign Gene" un film diretto e ideato da Emilio Insolera" (in Italian). 21 July 2017. ↑ TJ (24 October 2015). "Father of Sign Gene". Tokyo Journal . Retrieved 21 March 2017. ↑ The Games Machine (27 March 2017). "Sign Gene è il nuovo film di supereroi sordi" (in Italian). The Games Machine . Retrieved 20 August 2017. Denison, James. The Memory of Laurent Clerc: Dedication Address for Clerc Memorial, American Annals of the Deaf, Volume 19, Number 4, October 1874, pages 238–244. Gallaudet, Edward Miner. Life of Thomas Hopkins Gallaudet – Founder of Deaf-Mute Instruction in America by Edward Miner Gallaudet, 1888. For information about Laurent Clerc, see pp. 92 and following. Irving, Washington (editor). The Deaf and Dumb in: Analectic magazine. May 1820 issue. Philadelphia, Pa.: Moses Thomas, pp. 419–431. [ Link] to Google books. Lane, Harlan. When The Mind Hears: A History of the Deaf, by Harlan Lane. ISBN 0-679-72023-5 Chapter 1, "My New Family". Massieu, Jean; Laurent Clerc; and Roch Ambroise Cucurron Sicard. 1815. Receuil des définitions et réponses les plus remarquables de Massieu et Clerc, Sourds-Muets, aux diverses questions qui leur ont étés faites dans les séances publiques de M. l'Abbé Sicard, à Londres. (A collection of the most notable definitions and responses of Massieu and Clerc, deaf and dumb, to the various questions put to them, at the public lectures of the Abbé Sicard, in London). Cox and Baylis, London, 1815. Porter, Samuel. Retirement of Mr. Clerc, American Annals of the Deaf, Volume 10, Number 3, July 1858, pages, 181–183. Wikimedia Commons has media related to Laurent Clerc .